CCS is legal for trade. We hold certification for LB, GR, and OZ. Our dedication to our customers ensure your business can legally operate CCS software in coordination with the scale provided. Whether you’re a grocery store, deli, frozen yogurt shop or medical marijuana dispensary, we felt we should satisfy your success by getting the maximum certification possible. CCS integrates with many business types and scales to meet your business needs. Yogurt is your business, our business is to make you successful. We keep it simple, but make sure you can legally sell, tare and work in all states and provinces. The requirements have been evolving. When we first got our Certification the Department of Weights and Measures asked.. "Is this legal?" With so many requirements from the scale to the label, we know what's really going on in the USDA, the Department of Weights and Measures and most importantly: your business. Life tastes better when you pile the candy on the scale. Your life won't fall to pieces... of candy when you work with CCS. 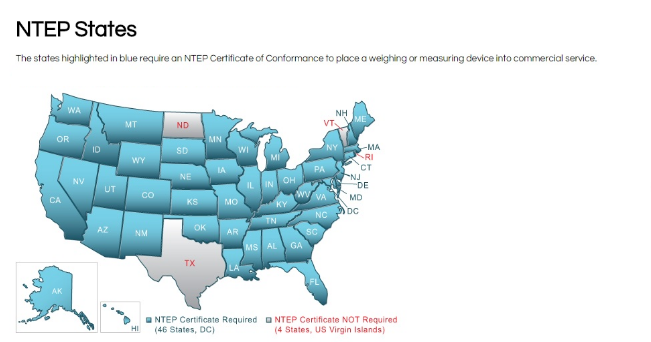 An official NTEP Certificate of Conformance is issued by National Conference on Weights & Measures (NCWM) following successful completion of the evaluation and testing of a device. This Certificate indicates that the device meets applicable requirements for commercial weighing and measuring equipment in the U.S. This NTEP certification will vary based on your location. Most states require NTEP certification. Only four states including the Virgin Islands do not. These four states that don’t require certification are: North Dakota, Texas, Vermont and Rhode Island. Upon purchasing your NTEP approved price computing scale, you will need to obtain certification for your scale from your state. Once you receive your scale, you will need to contact your individual state’s Weights and Measures Department to determine when to have your scale certified by your state.